Coaching or learning how to run properly after years of poor running isn’t an easy task. You’re unraveling a nasty habit that wasn’t created over night. It takes constant repetition of drill work over at least a six-week period to truly hone in an athlete’s form. You must get hands on feedback as well as consistent video footage to ensure change. The intangible aspects include receiving “buy in” from the traditional endurance athlete. Technique has never been the focus. Distance and volume has taken precedence. Switching the mindset is step number one. After that, it comes down to proprioception. Can the athlete feel what you’re talking about? Do they begin to understand strong running position over weak? As someone who has coached hundreds of athletes on running form, it has never been a one-size fits all approach. At Power Speed Endurance Clinics, we encourage athletes to connect with the drills that make the most difference for them. Throw out the ones that trip you up. It’s about creating awareness and uncovering a feeling. The book of running drills is not short of options, but what happens when an athlete simply cannot connect the dots? Constant video and cueing just doesn’t seem to do the trick? This is the only insole replacement I would ever recommend for a runner. Soon to release in spring, the ShoeCue is a smart product fulfilling a NEED for runners helping them understand right from wrong. Over the last month, I’ve messed around with these in my warm ups and drill work receiving immediate feedback from the insole. Obviously I’m not a heel striker by any means, but the smooth bumps on the heel let you know where you’re landing. It is the perfect tool for someone first trying to regain proprioception. Foot strike is a result of remaining in the proper position and successfully pulling verses pushing so we often don’t cue it as coaches. However, imagine something that buzzes you when you complete an incorrect movement pattern? The ShoeCue does just that without punishment. My recommendation is not to get too crazy with these insoles (such as run with them in a marathon), but use them as a training tactic. Implement them with your drill work and during your warm up runs. It is a quick way to have you or athletes explore right from wrong. Not something to rely on, but certainly a quick and seamless way to transform the most wrecked running form. When time allows, I’ll have athletes go barefoot at Power Speed Endurance Clinics and video their running form. Typically its a nice transition on day two to show them what happens when we take the cushion and impeding shoe away. Immediately the feet start landing further underneath the hips, form instantly clears up, and they receive feedback. If you run two hundred meters barefoot you quickly realize what’s right from wrong and where your feet are designed to land. You instinctively make the correction. 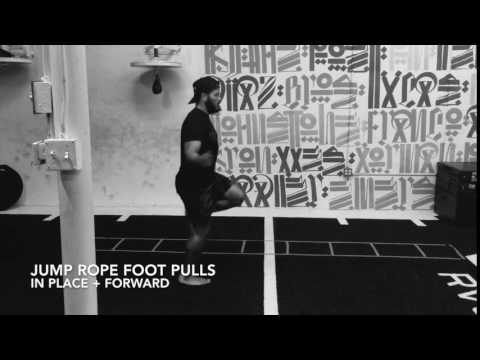 This can be a huge sell for athletes and becomes an outstanding way to rebuild foot strength. Think of implementing this with your or athletes from the very beginning. Find a safe surface to run six to eight fifty meter repeats and progress the volume week after week for the first six weeks. Monitor you or your athlete’s tissues as the volume builds and space out the sessions. Getting up to ten hundred meter repeats at smooth pace usually does the trick. Remember you’re using this as a technique tactic not for developing cardio-respiratory endurance. Let me ask you, can you heel strike when jumping rope? How about land outside of your general center of mass (hips)? Jumping rope is a flipping fantastic technique tactic. It puts together every drill we preach and doesn’t allow you to proceed unless you’re hitting the correct positions. Although it requires requisite single under abilities and a little bit of coordination, practicing this one will do wonders for your technique. Well there you go, a few technique tactics to implement in your own training or with your athletes. Don’t ever believe that one drill is the end all be all for creating change with running form. It comes down to learning teaching and uncovering awareness more than the actual drill itself. Create the connection and always go back to the basics when it starts to feel off.